Emma Woodhouse, “handsome, clever, and rich”, is Mr Woodhouse of Hartfield’s youngest daughter. Hers is the most prominent family in the village of Highbury, and as her mother passed away when she was young and her sister Isabella is married, she’s the mistress of the house. The story opens shortly after Miss Taylor, Emma’s former governess, becomes Mrs Weston by marrying a local widower. Having introduced the two, Emma gains a taste for matchmaking. Her new project is to join Miss Harriet Smith, a young Parlour boarder she befriends, and Mr Elton, the local vicar. But of course, things don’t quite go as Emma expected. Jane Austen famously said that Emma Woodhouse was a heroine that nobody but herself would much like. Emma’s flaws are undeniable – she’s snobbish, much too fond of interfering in other people’s lives, careless and even occasionally cruel, and blind to her own flaws. Despite all this, to me she wasn’t wholly unsympathetic. But I could see myself very much enjoying Emma even if she had been. In many ways, her flaws make the novel. As a comedy of manners, Emma is absolutely brilliant. I laughed more, and enjoyed Austen’s renowned irony, more than with any of her previous readings of her books. I think that part of what makes it work so well is the fact that the tone of the narration is just right – the scenes featuring Mrs Elton, for example, were subtly and deliciously incisive. I can’t remember the last time I encountered an intolerable character I enjoyed reading about so much. But as Melissa was saying on Twitter the other day, that’s part of the genius of Jane Austen. The fact that Emma is so well-off means that, unlike most women at this time, she doesn’t have to look at marriage as a career, and she doesn’t face the risk of living in poverty if she doesn’t make a good match. The Jane Fairfax storyline, however, means that this theme is still present in the novel. Jane is an orphan who is spending the summer with her aunt and grandmother, Mrs and Miss Bates. Sooner or later, she will have to find a position as a governess so that she can support herself. I’ve yet to mention any of the romances – I have to confess that due to repeated views of the movie Clueless in my teen years, I knew how everything would play out. But that didn’t keep me from ear to ear during the scene in the garden, for example. Reading Emma made me feel like I had moved to Highbury and become one of its inhabitants. I lost myself in Emma’s world, and soon discovered that I cared about the fate of each and every one of the characters. Oh, isn't it brilliant though! I read it when I was thirteen and Emma seemed so tempestuous, even in my teenage years! Ah, the garden scene. And the brilliance of Austen -- love the Virginia Woolf quote! I've seen Clueless way too many times too :p I don't know if I'd like this one or not! I read Persuasion last year and I guess I liked it enough, I just really can't get into Austen's style...Eva get's mad at me about that :p I should try her again. Maybe with Northanger Abbey? I liked this book, too. I hope to read Sense & Sensibility soon. I honestly can't get into Austen books very much. They're good, but not wonderful. They get tiring after awhile, as she tells the same jokes over and over. Emma was particularly bad at that. On the other hand, as evidecenced by my review (http://zenleaf.blogspot.com/2008/06/emma-by-jane-austen.html), I didn't know Clueless was based on Emma, but was seeing the similarities all through the beginning of the books. Jason had to point out to me that Clueless was based on Emma, and then I kept wondering how Emma was going to present the gay friend from Clueless...anyway, I was pretty distracted when I read it and had to watch the movie afterwards. It's sort of the quintessential movie from my teenage years...yeah, I'm a nerd. The best I can come up with is what I said in my review, while it was extremely funny and full of irony and satire, it was just missing a sense of warmth, and so the irony and satire came off feeling more harsh and cutting than it needed to. Aimee: I can see why Charlotte Brontë said that, as her characters are all a bit more restrained than, say, Jane Eyre. Still, I think they're far from cold! Melissa: Mr Darcy is definitely my least favourite so far :P Go Mr Knightley and Henry Tilney! Chris: It could be that she's just not for you, but I think her style may be an acquired taste :P The language flowed a lot better for me this time than it had with wither P&P or Northanger Abbey. It's not that it's any different, it's just that I'd gotten used to it, I guess! But yes, try Northanger Abbey - it's my favourite so far! Plus, it's short :P I think you'd enjoy all the references to reading and to Gothic conventions. Fyrefly: I can definitely see your point. It's definitely more biting than her others - the ones I've read so far, at least! I am ashamed to say I've only read one Jane Austen, Pride and Prejudice, and that was just a few years ago. Ever since I've been afraid that none of the others would live up to P&P. "As a comedy of manners, Emma is absolutely brilliant. I laughed more, and enjoyed Austen’s renowned irony, more than with any of her previous readings of her books." This gives me hope that they do. Perhaps I'll read Emma soon! 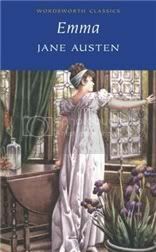 This is the only Austen book I don't like and that's because I studied it at A'level. After analyzing what felt like every line I was sick to death of it. But if we hadn't studied it I may never have picked up her other books all of which I love. aw, beautiful review, Nymeth! I've seen the movie and Clueless so I too would know what would happen, but I just love the world of Austen. I haven't read this yet but I look forward to doing so!! Austen rocks. Particularly with zombies. Emma is the last Austen I haven't read! For that more than anything else I'm hesitant to read it. I also found it boring the first time, but I was maybe 15, and thus excuse myself, LOL. I know I should read it, especially now that you've made it sound fantastic, but then there will be nothing new left, a true shame. I've read this book a couple of months ago and I absolutely loved it. I am glad that you enjoyed it too. Great review! I'm sort of a newbie at the Austen thing, having only read P&P and Persuasion. I loved them though! Austen subtlety is her genius. Although I've seen Clueless plenty of times (and now my daugher is hung up on it!) I'll probably read Emma next. After all, it is my daughter's name! Lovely review. I need to read this. I didn't like Emma. But I am not an Austen fan, so I feel like I can't say much. It's just not for me. I love Emma. In all those silly "Which Austen character are you?" quizzes, I always get Emma Woodhouse. I'm even considering naming my first baby girl (due in January, yay!) Emma. Emma was my second Jane Austen novel and while I wasn't sure at first Emma and I would get along, she eventually grew on me. I have fond memories of my time with Emma. I am glad you enjoyed the book too, Nymeth. Here's a link to myreview from two years ago if you're curious. I tried reading Emma while I was in high school and just could not get into it. I'll have to try again, most definitely! p.s. : yay for Clueless! I'm currently reading Pride and Prejudice, and not really enjoying it. But I'm also reading Pride and Prejudice and Zombies, and that is helping somewhat. I'm just not an Austen fan...I find it a bit tedious, the gossip and the focus on manners and propriety and how much income everyone has. I don't think I actually ever read Emma, although I loved Clueless, of course! I suppose it gives me a cultural deficit that should be remedied! I am feeling a little guilty. I have yet to read my first Jane Austen book. I feel so bad, when everyone else has read them. I don't really have anything to add as I agree 100%. You can't go wrong with Jane Austen. I haven't read this one in a while, but remember it being a real treat. I agree; Austen's tone in Emma really is more fun than in any of her other novels except possibly Northanger Abbey (one of my favorites because of its parody of the Gothic novel). I never understand how people can find Austen's novels "tedious." The only remedy for that is to read other novels of the period! Emma is one of my favorites! Jane Austen is amazing. Period. !! I just finished reading Lady Susan. I definitely recommend it! It's very fun and lively. I'm glad you enjoyed Emma - it gives me hope! I've tried to pick up this one multiple times but could not get into it. However, I haven't tried in the past few years, so maybe I'll give it a chance again! If I decide to try Austen again I'll have make sure to pick this up since Persuasion just didn't cut it for me. I have to confess, Pride and prejudice is the only Austen novel I've read. I liked the book, though I didn't swoon over Darcy. But somehow I've never got around to reading the rest of her works. Which book would you suggest I pick up? One of my favourite English teachers once likened me to Emma... I don't think it was that complimentary but I loved it anyway! I must reread Emma, perhaps for the Everything Austen challenge. I've read all of the completed novels now and love them all in different ways. I really should get started on more of Austen's books! Thanks for the reminder, Ana! Great review!! I love Austen so much. She is just so CLASSIC it kills me. Thanks for the great review I was happy to see this. Emma can be hard to take sometimes, but I really love the novel for all the reasons you mentioned. Although I've watched the movie numerous times, I still haven't read the book yet! :O I'm ashamed at myself for not reading the book earlier. I know everyone adores P&P, but this is my favorite Austen novel. It may be the case of right book, right time, or just really enjoying the characters. I'm glad you liked it too! She is so flawed, but such a delight. I have not read Emma yet, though I saw the movie a very long time ago. So long I hardly remember anything. I need to read this. There's just something about Emma, right? I mean, the snobbishness for the most part would totally get to me and yet I can't help but like her. I don't know if you've seen the film version starring Kate Beckinsale (sp?) but it is delightful. Of all of Jane Austen's books (there are actually still a couple I haven't read), I have to say "Emma" is probably my favorite. Yep, even above "Pride and Predjudice". Love the "Clueless" movie and the movie with Gwyneth Paltrow. I have seen Emma but I haven't read it yet. I definitely plan on reading it someday though. Glad to see you liked it. I'm with you and Woolf. I think Austen always does a fantastic job of showing emotion without ever stepping outside the bounds of propriety. Her characters are always aware of what is and is not permitted, and most of them find ways to express both their passions and their displeasures without ever putting a toe out of line. It's been years since I read Emma and you're making me want to read it again! I think an Emma DVD viewing may be in order for the Everything Austen challenge. So which Austen do you plan to read next? I loved this book when I read it a few years ago. Although Emma isn't a character to fall in love with I think she's very interesting to read about. I, too, loved the garden scene, and I think that is the scene that houses my favorite little snippet from the novel "Badly done, Emma!". I am so glad that you enjoyed this book! Emma isn't the favourite of my Austen books, mostly because I don't like her snobbishness, but that doesn't mean i don't enjoy it when she suddenly realizes that she might be in danger of losing the man she discovers she does love! I like the puns with the names too. I like Knightley, and I really like the social criticism the most I think that Austen puts into this book. It is redeemed by Emma getting her comeuppance and learning her lesson. but for heroines, I'd have to say Elizabeth Bennett and Anne Elliot wins hands down every day!